The latest from the mind of Michel Gondry (creater of the wonderful ‘Eternal Sunshine of the Spotless Mind), is an inventive and strange film, set in a version of Paris that feels both deeply familiar and completely alien. Broadly a romantic comedy, it stars Romain Duris as a rich man named ‘Colin’, who lives at home with his cook, Nicolas (Omar Sy), and spends his time with his best friend Chick (Gad Elmaleh). 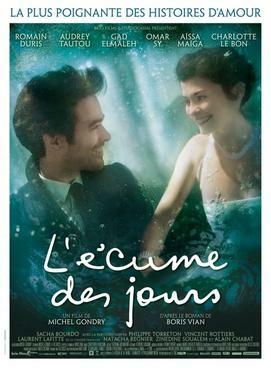 On finding out that Chick has fallen in love, he feels he has to do the same and shortly thereafter he meets the alluring Chloe (Audrey Tautou) at a party. The initial stages of the film are superb, showcasing Gondry’s particular visual style and brand of whimsy, and there’s a wonderful light touch to proceedings. It’s utterly surreal, but in the nicest possible way and we feel invested in Chloe and Colin’s courtship, largely because of the excellent chemistry between Duris and Tautou. The film takes a darker turn in the second half, when Chloe discovers she has a rare disease caused by a flower growing in her lungs. This is where the problems start to occur, and this part of the storyline isn’t nearly as compelling or as moving as Gondry wants it to be. Disappointingly, I found a film that had whizzed by in the opening stages starting to drag, and that’s never a good sign. It’s a shame really, as Gondry has shown in the past his ability to handle darker material (again I’ll cite ‘Eternal Sunshine’), but it doesn’t come together nearly as well in ‘Mood Indigo’. Overall, I liked aspects of the film, and the first half is wonderfully breezy, but it starts to drag in the last half hour and that takes away from my overall enjoyment.